Is Cheyenne River Indian Outreach an accredited organization? 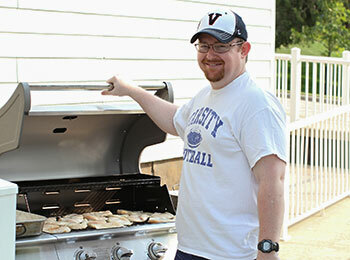 Staff at the Child Services Center meets standards for supervision, safety and nutrition while enjoying activities like grilling out with students. Thanks to your generous support, Cheyenne River Indian Outreach is able to help an average of nearly 400 Native American women and children each year. Because of the kinds of services we provide, a portion of funding also comes from federal grants through the South Dakota Department of Social Services. Licensing for the Child Services Center operated by Cheyenne River Indian Outreach comes from the South Dakota Department of Social Services. As a part of state licensing requirements to provide group home care for adolescents 24 hours per day, the Child Services Center meets standards regarding supervision, safety and nutrition. The Child Services Center has a license review meeting each year with the South Dakota Department of Social Services. The review includes an evaluation of training provided to staff, care policies and procedures, as well as interviews with clients and personnel. The domestic violence shelter receives some funding through grants from the Federal Government through the South Dakota Department of Social Services. While our state does not “license” domestic violence shelters, they undergo regular evaluations by the South Dakota Department of Social Services. These evaluations include reviews of policy and procedure to ensure compliance with the Violence Against Women Act (VAWA), as well as financial reports. These requirements must be met in order to continue receiving the funding needed to keep our doors open. Pilamaya — thank you — for helping provide a safe place for Native American women and children in need 24 hours per day, 365 days a year!